If you stand up to someone, especially someone more powerful than you are, you defend yourself against their attacks or demands. All but two of the European Union's 27 member states sign up to a treaty that threatens sanctions for breaches of budget deficit limits. Paul Chapman reports. REPORTER: All but two of the European Union's 27 members have signed up to a new treaty on tighter fiscal rules. Britain's refusal to sign was flagged well in advance. BRITISH PRIME MINISTER DAVID CAMERON: "The key point for me here is what is in our national interest and our national interest is that these countries get on and sort out the mess that is the euro." REPORTER: On the other hand the Czech Republic's opposition to the deal that threatens sanctions for breaches of EU budget deficit limits is more puzzling for French President Nicolas Sarkozy. FRENCH PRESIDENT NICOLAS SARKOZY: "We have taken note of that decision, which is some kind of clarification, although I'm not sufficiently familiar with the ins and outs of what's going on in Prague to be able to understand why what was acceptable in December is no longer acceptable now." REPORTER: The treaty, which demands the incorporation of tighter budget rules into each nation's legislation, is being welcomed by European Central Bank President Mario Draghi. MARIO DRAGHI: "It is the first step towards a fiscal union. It certainly will strengthen confidence in the euro area." REPORTER: The summit in Brussels also agreed to bring in a 500-billion-euro European Stability Mechanism to back heavily-indebted countries a year earlier than planned. But differences over austerity limits and Greece's unfinished debt restructuring talks wrecked hopes for a more upbeat message that Europe's getting to grips with its debt crisis. Paul Chapman, Reuters. If a plan or a project backfires, it has the opposite result to the one intended. • Turkey's attempts to intimidate France and other countries over the question of the Armenian genocide are bound to backfire. 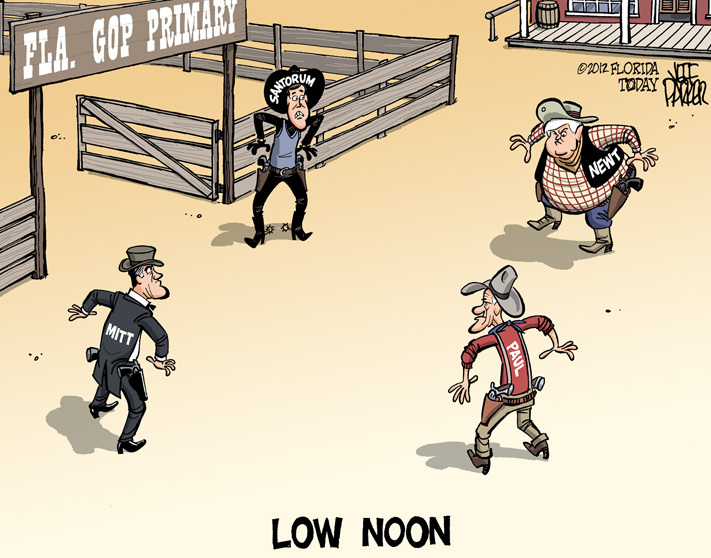 Newt Gingrich's South Carolina Republican primary win last weekend, turned Florida's primary into the OK Corral. Who will be be last man standing? Who knows? But as Florida is a closed primary state, with a delegate count greater than Iowa, New Hampshire and South Carolina combined, the winner will most likely emerge as the Republican nominee once the smoke clears. 1. The title of the cartoon Low Noon is a play on the title of the classic western High Noon, which film tells in the story of a town marshal forced to face a gang of killers by himself. However, the cartoon itself references a real life event from 1881: the Gunfight at the O.K. Corral, which has been depicted in many western movies including Gunfight at the O.K. Corral and My Darling Clementine. 2. FLA is an abbreviation for Florida, where the next Republican primary will take place on 31st January. 3. GOP is an abbrevition for Grand Old Party, a nickname for the Republican Party. Inappropriate spending cuts could "strangle" growth prospects, the head of the IMF has warned. Austerity programmes must be tailored to each economy, Christine Lagarde said, and not be "across the board". The International Monetary Fund has been one of those stressing the need for countries to cut their debts, but some fear this could hit growth. The correct response to the eurozone debt crisis has been a major debate at the World Economic Forum in Davos, as Tom Esslemont reports. If you waive your right to something, for example legal representation, you choose not to have it or do it. • Kansas is asking the federal government to waive some rules so the state can overhaul its Medicaid program. Davos is a ski resort, and in the cartoon David Cameron is shown flying through the air after skiing off a rock. He tells Angela Merkel, who is heading up to the EU summit on a ski lift, "You've got to be bold, decisive!" Cameron told his Davos audience, "In Britain, we are taking bold steps necessary to get our economy back on track, but my argument today is that the need for bold action at European level is equally great." However, on Wednesday, data showed that the UK economy contracted by 0.2% in the final quarter of 2011 and is on the brink of plunging back into recession. So Cameron's skiing accident can be seen as a metaphor for his government's handling of the UK economy, and the result of his 'bold, decisive' action. Someone who is bold is not afraid to do things which involve risk or danger. If one thing sparks another, the first thing causes the second thng to start happening. • Twitter's announcement of country-specific censorship has sparked outrage among many Twitter users. This cartoon by Mac from The Daily Mail combines two news stories: the spiralling cost of the Olympics and the growing number of pensioners facing fuel poverty. A couple of pensioners are trying to keep warm in their living room. The man is studying a pile of bills. The woman, who is reading a paper with the headline "True Cost of Olympics £24 billion", tells him: "Look on the bright side—we've got tickets for the ladies' synchronised swimming." The joke is that synchronised swimming has the reputation for being one of the most boring Olympic events, so it's not much consolation. As usual with Mac cartoons, there are some lovely details: the shivering dog trying to warm itself in front of a candle, the hot water bottle under the woman's feet, and the half-eaten biscuit on the table. If you look on the bright side, you to try to see something good in a bad situation. • Look on the bright side—the accident insurance might pay for a new car. Facebook, the leading social network, is expected to file for an initial public offering as early as Wednesday, February 1, the Wall Street Journal reported. Conway G. Gittens reports. REPORTER: Facebook wants to be friends with Wall Street. The world's leading social network is preparing to file an initial public offering as early as Wednesday, according to the Wall Street Journal. The IPO would value Facebook at between $75 billion and $100 billion, the report, citing unidentified sources, stated. The report also noted Morgan Stanley and Goldman Sachs are expected to play lead roles in what may be one of the biggest and most anticipated IPOs in U.S. history. However, investors should be careful not to get caught up in the hype, warns Jim O'Shaughnessy of O'Shaughnessy Asset Management. JIM O'SHAUGHNESSY, CHAIRMAN/CEO, O'SHAUGHNESSY ASSET MANAGEMENT: "Many IPOs come out being very, very overvalued because they get so hyped up and investors are so taken in by the story that they're willing to pay any amount just to be able to get into the stock. That generally translates to being very overvalued. So we generally tell investors that they should wait, probably a good full year before they look at buying a stock that was recently IPO'd." REPORTER: Facebook declined to comment. Conway Gittens, Reuters. In Roman Catholic, Orthodox, and Anglican churches, an archbishop is a bishop of the highest rank, who is in charge of all the bishops and priests in a particular country of region. • Pope Benedict XVI on Wednesday appointed Joseph Coutts as archbishop of Karachi. This cartoon by Andy Davey from The Sun relates to UK Prime Mininster David Cameron's attack on the "madness" of European regulations and taxes in a speech to global business leader at the World Economic Forum in Davos. Andy Davey's cartoon shows David Cameron as Saint George, the patron saint of England, fighting a dragon made up of red tape and labelled EU. Cameron is wielding a sword and shield but has lost his helmet. 2. The red cross on Cameron's shield and tunic is the St George's Cross, which is also the flag of England.